MONTEBELLO, Calif.—Over 600 Armenian school students from across Southern California gathered at the Armenian Genocide Martyrs Monument in Montebello, California, to honor the memories of their ancestors and commemorate the centennial of the Armenian Genocide. Students, parents, faculty, and administration were present from the following California Armenian schools: Ari Guiragos Minassian Armenian School, Armenian General Benevolent Union Manoogian-Demirdjian School, Armenian Mesrobian School, Armenian Sisters Academy, Charlotte and Elise Merdinian Armenian Evangelical School, and Holy Martyrs Ferrahian Armenian School. Welcoming everyone on behalf of all the Armenian school principals in his opening remarks was David Ghoogasian, Principal of Armenian Mesrobian School, which hosted the event. Mayor of City of Montebello Jack Hadjinian was in attendance and spoke alongside Montebello Councilmember Vivian Romero and Montebello City Manager Francesca Tucker-Schuyler who both expressed their solidarity with the Armenian people’s call for truth and justice for the Armenian genocide. All students sang “Soorperoo Achkeruh”, followed by a performance of “I Remember” by Paola Kassabian along with Ferrahian school students Sose Hovannisian and Shaunt Ghazourian. “Each of you is a living monument, each of you will continue the Armenian people’s fight for justice,” said Gevorg Iskajyan, Executive Director of the Armenian Genocide Centennial Committee, in his remarks to the students. 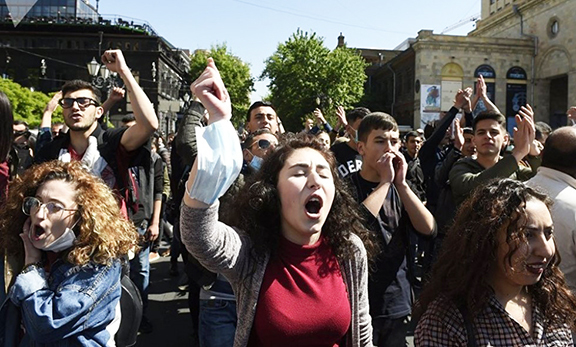 Armenian Sisters Academy students sang “The Martyrs of April” (Abrilian Nahadagner) as students ascended to the monument to take part in the requiem service (‘Hokehankist’ – Repose of Souls) for the victims of the Armenian Genocide and victims of crimes against humanity. Every school presented wreaths that were placed at the monument. The prayer was led by the Armenian Apostolic Church Western Prelacy’s Father Nareg Pehlivanian, the Western Diocese of the Armenian Church’s Father Sarkis Petoyan, the Armenian Catholic Church’s Father Thomas Garabedian, and the Armenian Evangelical Church’s Reverend Hendrik Shahnazarian. People left the event feeling moved and inspired by the commemoration and the show of unity between the local Armenian schools and communities.